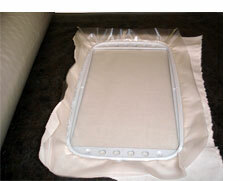 This thin water soluble topping film will prevent the stitches from sinking into the fabric. You will be amazed to compare "with" and "without" stitchouts. "With" can be a gorgeous design, and "without" - bad or totally ruined piece of embroidery.